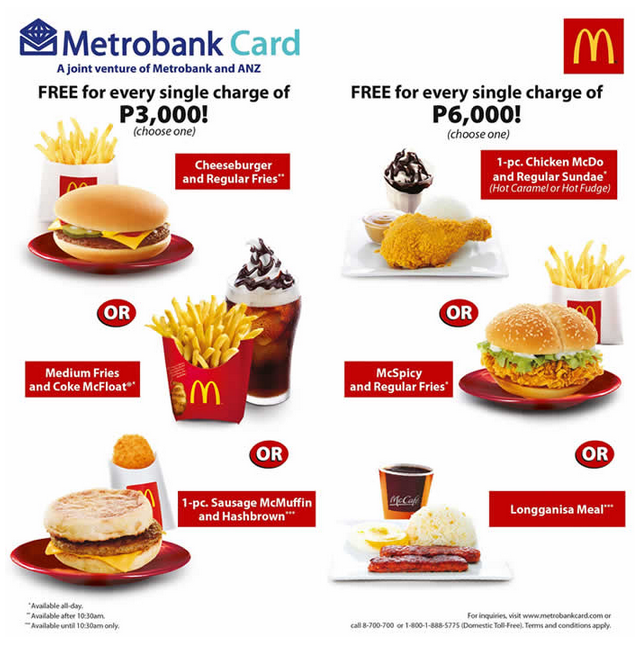 2014 McDo Treats w/ Metrobank ~ Philippine Freebies, Promos, Contests and MORE! Get your daily fix of the latest McDonald's Treats with your Metrobank card. Shop for at least P3,000 and enjoy choices of 1 McDonald's Cheeseburger (a la carte) and 1 Regular Fries or 1 McDonald's Medium Fries and 1 McFloat or 1 McDonald's Sausage McMuffin (a la carte) and 1 Hashbrown. On the other hand, 1 McDonald's 1-pc Chicken McDo (a la carte) and 1 Regular Sundae or 1 McDonald's McSpicy (a la carte) and 1 Regular Fries or 1 McDonald's Longganisa Meal await those who made single-receipt purchases worth P6,000. Simply present your charge slip and card at any McDonald's branch nationwide (except McDonald's Boracay) to claim your yummy treat. You can redeem a maximum of one (1) product per valid card per McDo store. Also, redemption is valid for dine in and take out orders only. Not valid for McDonald's Drive-Thru or McDonald's Delivery.